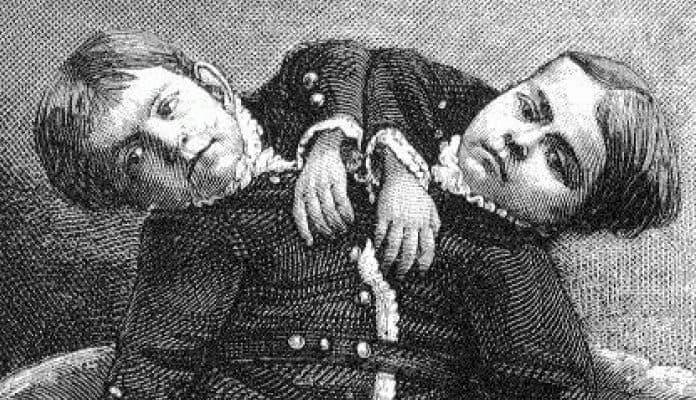 The Tocci brothers have long been regarded as one of the most famous conjoined twins in history; some would say second only to Chang and Eng Bunker. They spent most of their early lives on tour throughout Europe and the United States and earned a lot of money off of their condition. Doctors couldn’t get enough of them, nor could the mass public. But at about the time that they turned 20 years old, they completely disappeared from public life and lived as recluses in Venice, Italy. Much of what we know about them is either sensationalization, due to their immense celebrity, or speculation because we don’t know much about their personal lives, mainly after they retired. A drawing of the conjoined Tocci twins. sideshoworld. Very few conjoined twins survived long after birth before advances in modern medicine in the twentieth century, as they face physiological challenges such as shared organs that cannot perform their functions for two individuals. For those few that did survive, becoming a part of a traveling exhibition in which they were featured as “freaks” was pretty much the only way to make a living. From the nineteenth century on, conjoined were commonly referred to as “Siamese twins” because of the traveling exhibition featuring Eng and Chang Bunker, who were of Chinese descent but born in Siam (what is modern-day Thailand). Giacomo and Giovanni were probably born on or about October 4, 1877 (scholars debate the exact date of their birth) in Locana, Italy as the firstborn to their 19-year-old mother. She had a relatively easy, uneventful labor, as the boys were quite small. When they were born, their mother doted on them, but for their father, the boys’ conjoined state was too much. He had a nervous breakdown a month after their birth and checked himself into a mental hospital. None the less, the couple went on to have seven more children, all of whom were healthy.